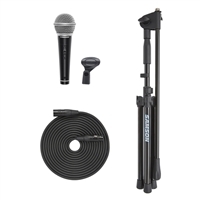 The R21S is a handheld dynamic microphone that excels in both vocal and presentation applications. Equipped with a linear frequency response for superior reproduction, its also designed to withstand high SPLs. Extremely sensitive, it employs a tight cardioid pickup pattern to reduce feedback. A special shock-mounted element minimizes handling noise and provides additional protection.